Discussion in 'Traditional Folders and Fixed Blades' started by Trout Hound, Dec 24, 2016. So here's something I've been pondering on lately: In your opinion, what is the most iconic American traditional fixed blade? Or maybe it's a tie between two or three. The one that jumps to my mind immediately is the Bowie. What else? Thanks, and Merry Christmas!!! I would have to agree with the Bowie. Oddly enough I have never owned a fixed blade Bowie. I think I'm going to put that on my wish list. I'd say the leather stacked 4" to 6" hunting knives of the '20s and '30s many whose designs, like Remington, Case, Kinfolks, Western, Marbles, etc., continue to today. Growing up in the 50's and early 60's, I saw the Bowie on TV shows but I think the WWII Kabar was what I saw around me. The first knife I wanted, and got, was a Boy Scout stacked handle. Ontario 499 "Pilot Survival Knife"
"Patch Knife" as widely used by the mountain man, even though it is basically what we call a "paring knife" today. I guess I automatically think of the hunting knives. So a drop point hunter, the Buck 102 Woodsman and of course the Schrade Sharpfinger. Going back a generation or two, Marble's Ideal Hunting knife. It started the trend towards, and I use the term knowing it is misleading, the "blood groove". At one time, there were a host of imitators. Prior to the late 19th century, outdoorsmen and military personnel did not use knives that were notably different from the knives used by butchers. Blades were relatively thin and the handles were often no more than two wooden slabs riveted to the tang. Serrations appeared on knives in the 19th century for use as a wood saw or fish scaler. 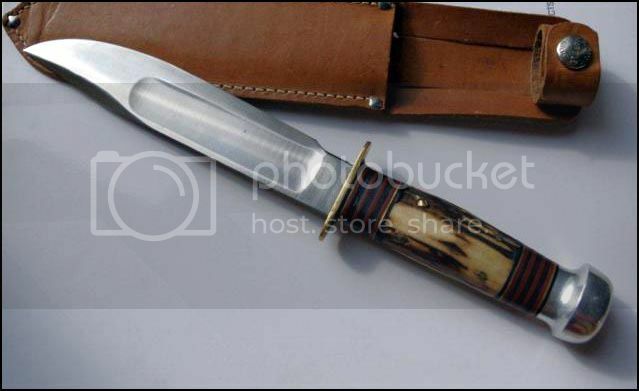 Around the turn of the century, Webster L. Marble introduced the modern concept of the "hunting knife." These knives incorporated heavier blades, crossguards, and pommels. They very much resembled miniaturized Bowie knives. Here's a nice example (not my knife) posted by Clem in the above link. I'd say the bowie is tied with the Ka-Bar. It's like comparing the Colt Peacemaker with the 1911. Both are about as American as they come, just of different generations. A Sharpfinger would be up there too. The Bowie may be the iconic type, but it would be difficult to point to a single concrete example, especially the knife in my mind's eye, a big trailing point or clip point fighter. Such a knife is almost certainly not the type of knife Bowie actually carried and fought with. OTOH, both the Kabar and the Buck 119/120 clearly derive from the archetype, so I would pick either, or both, as the iconic fixed blade. I was going to post a pic of my Randall #5-6, but I think Frank nailed it... the other iconic fixie that comes to mind is a Kabar USMC... and if you follow the heritage backwards you get back to Frank's post. 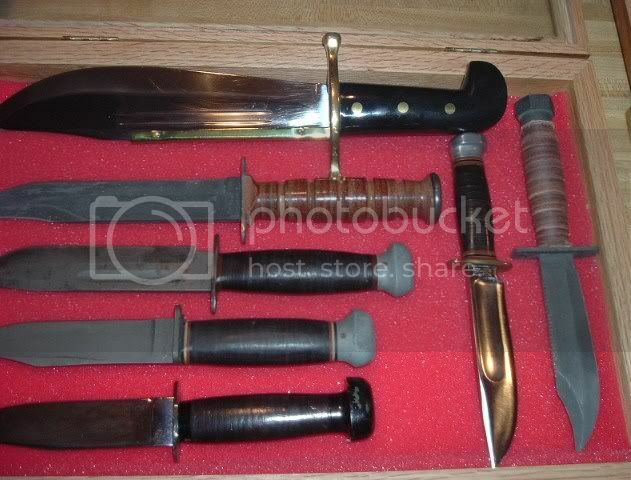 I am also going to have to go with the Bowie knife. But since there is no set definition of what a Bowie Knife is, and there is no certain agreement on what that Sandbar knife actually looked like that made him famous, I think that the most iconic American Traditional Knife that actually has a concrete definition and appearance is the USMC Ka-Bar. Not the most original post, but the thread is about iconic knives. The marbles ideal is definitely a good one. if there was one particular Bowie knife that's a highly recognizable American icon, I think we could all agree that the western w49 definitely fits the bill. All this and not a single Woodcraft? Looking at the most iconic American knife from an European perspective, I agree, it's the Bowieknife! Since early boyhood, the myth and lore around the Bowieknife has always interested me. Today I have learned a lot more and I'm now aware of, that the style I prefer is called a Hunting Bowie and is up to 8" in bladelenght. The genuine and iconic Bowie's were primarily weapons and mostly larger than the later Hunting Bowie's. Nevertheless, they caught my imagination and I still like to see pic's of fine Bowieknives and read the storie's about them.